Solomon Kane is a shaky attempt at establishing a new film franchise based on another one of Robert Howard’s pulp fiction classics. Robert Howard is perhaps best known as the creator of Conan the Barbarian, the sword and sorcery adventurer who was brought to the big screen in the 1980s by John Milius with considerable success, but he’s also a character who stumbled out of the gate with last year’s attempt at a reboot. So who is Solomon Kane? He’s a mutt of a character if ever there was one. In this particular adventure he roams the brutal, raw tundra of 1600s England. Like Conan, he’s no stranger to swords or sorcery. What differentiates him, apart from time and place, is his pedigree. He’s the disenfranchised son of a king; Solomon nearly kills his miscreant brother (and heir to the throne) when he finds him molesting a young woman. Burdened by an overwhelming sense of right and wrong, he’s a complex man. He starts out as a hell-bent warrior in the Queen’s army who shows no mercy on the battlefield. Following a run-in with the Devil’s reaper, who informs him it’s time to check in to Hotel Hell, Solomon has a change of heart, flees the knights in Satan’s service, and seeks refuge in a remote monastery. Having donated all his money to the church, Solomon lives in seclusion, studying the ways of peace. Studying, that is, until darkness moves over the monastery and he’s told he must leave. After being taken in by a soulful family of the land, Solomon finds a chance to earn his soul back when their daughter is kidnapped and father murdered. If the Devil wants to keep his soul, he’s going to have to fight for it. 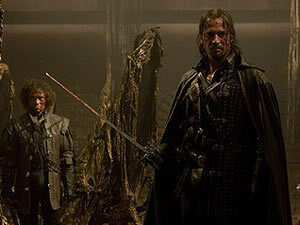 Solomon Kane premiered at the Toronto International Film Festival back in 2009, sloooowly made its way all the way around the world, then finally made its way back to the New World. Why the lengthy journey to the cinematic promised land? Well, the movie’s not the potboiler Milius made of Conan 30 years ago. This movie’s a hodge-podge of story elements that could, in the right hands, be a helluva ride. Given the involvement of Satan, his leather-faced reaper, and a church-held flock of zombies, that “helluva ride” notion could be taken both figuratively and somewhat literally. What is presented on screen, though, doesn’t reach that ideal. As written and directed by Michael J. Bassett (who also helmed the forthcoming Silent Hill: Revelation 3D), there’s a pent-up ambition seeking to be properly exorcised with a worthy story and vision all within the confines of a relatively modest $45 million budget. But, instead of gelling together as an elegant cocktail of revenge and religion, Solomon Kane’s stab at sweeping, epic moments (such as when Solomon looks up to the rain-drenched heavens and asks, “Is this all that I am to you?”) feels less like Gone With the Wind and more like A Mighty Wind. Conan has his sword and loincloth. Indiana Jones has his whip and fedora. Solomon Kane has his buckled Puritan’s hat and cape. Iconic imagery abounds in Solomon Kane; Solomon has a cross to bear and it’s etched right on his back as a grisly, painful-looking tattoo. Solomon’s even crucified alongside a couple other men. It doesn’t get much more blatant than that in terms of presenting religious themes of sinfulness and redemption; and the names of many of the characters carry a Biblical heritage. In particular, there’s Solomon, Kane (a derivation of Cain), Malachi, and Josiah. Solomon Kane isn’t all bad; there’s enough interesting material to make it feel like a shame that it all doesn’t come together more effectively. Indeed, some of the visual effects are quite well done, as is the overall production design and character makeup. There’s also a decent cast, including A-lister Max von Sydow (Flash Gordon), quirky indy-film fave Pete Postlethwaite (Killing Bono), Mackenzie Crook (the initial Pirates of the Caribbean trilogy), all led by star-in-waiting James Purefoy (John Carter) as Solomon Kane. Heck, it even has a score by Klaus Badelt, who composed Jack Sparrow’s first adventure in The Curse of the Black Pearl. All those elements were put into the fiery furnace, but instead of coming out a gleaming sword of tempered steel, it’s more like a steak knife with a jagged edge.